"..... तर मग पुणे महापालिकेच्या स्थायी समितीची आवश्यकताच काय ?" 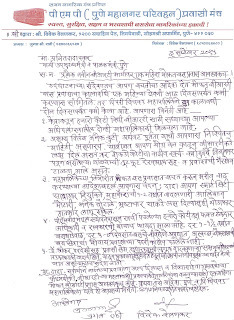 Please see attached note in Marathi personally handed over to you today. Sajag Nagrik Manch & 4 other Ngos request you to reconsider the resolution passed re appointment of Mackenzie for SMART CITY PROJECT REPORT. गमावलेली विश्वासार्हता मिळवणेसाठी व प्रवासी पीएमपी कडे वळवणेसाठी एक महिना मोफत बीआरटी बस प्रवास नवीन मार्गावर आवश्यकच …. ! One month free pmp bus travel on new BRT corridor is necessary to regain the lost trust & attract citizens to bus/ public transport. You are earnestly requested to give directions & advice to PMC & PCMC. 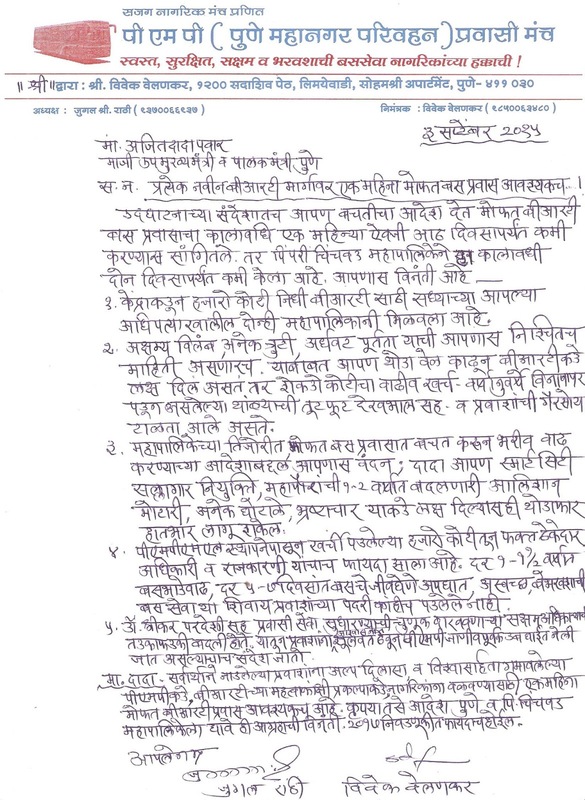 A representation in this regard in marathi is attached. Awaiting your citizen friendly prompt decision गमावलेली विश्वासार्हता मिळवणेसाठी व प्रवासी पीएमपी कडे वळवणेसाठी एक महिना मोफत बीआरटी बस प्रवास नवीन मार्गावर आवश्यकच …. ! बीआरटी चे OPERATIONAL व आर्थिक नियोजन करा; सर्व हिशेब स्वतंत्र ठेवा, पीएमपीएमएल वर व पर्यायाने बस प्रवाश्यांवर एक पैश्याचे ही भार टाकू नये- सर्व बोजा महापालिका व शासनानेच उचलावा ! The mail is being resent to draw your immediate attention as a BRT Corridor is being inaugurated tomorrow and there is no response from either. This is most important for the BRT to be transparent and to fix responsibility & Ownership. BRT delayed for years,deficiencies,cost escalations,haste to submit compliance of 1000+ crores of funds,ghost of consultants fees,etc etc bound to result in heavy losses for years. As such a separate BRT bank account be opened and Complete BRT Accouts be kept independent of PMPML. For better & effective implementation of BRT ; OPERATIONAL & FINANCIAL PLAN be prepared for 5 years, and monitored regularly. NO BURDEN WHATSOEVER BE LAID ON PMPML & ITS BUS COMMUTERS; बीआरटी चे operational व आर्थिक नियोजन करा; सर्व हिशेब स्वतंत्र ठेवा, पीएमपीएमएल वर व पर्यायाने बस प्रवाश्यांवर एक पैश्याचे ही भार टाकू नये- सर्व बोजा महापालिका व शासनानेच उचलावा ! The prompt positive action is solicited. Hon Chief Minister, is requested to save PMPML ,the only public transport for 60 lakhs citizens of PUNE & PIMPRI CHINCHWAD.